This innovative course, designed for children aged three to six years old, introduces a programme of 'fun through achievement'. The activities are adaptable to different ages, skills and levels of development. Six year olds may, as in previous years, opt for the Children's Activities course instead, if parents feel that they are able to keep up with the pace. The Troopers will be safely situated in their own area with ample space and facilities for both indoor and outdoor activities. The course includes treasure hunts, swimming, party games and parachute play, as well as quieter moments for story time, practical puzzles and creative arts and crafts. A recent addition to the course is more focussed, outdoor activities such as den building and a nature trail. Five and six year olds may also have the opportunity to do a spot of canoeing. Whatever their level, the children will be encouraged through a sense of achievement and self-fulfilment. Staffed by an expert and qualified team, the children are cared for in a fun and secure atmosphere with a ratio of five to six children to each tutor. Children may attend this course during mornings only, afternoons only or as a full day. There will be a quiet period of rest after lunch for those attending the full day course. Lunch is included for full day children only. Although there is no special evening programme for Junior Troopers, they are welcome to attend the Children's Activities 5pm show, if accompanied by a parent. Please note that we do not accept children who are still wearing nappies. The Junior Troopers programme is committed to supporting care and learning in accordance with the current Early Years Foundation Stage guidelines. Junior Troopers is a multi-activity programme for children aged from 3-6 years. It includes the promotion of basic movement skills; creativity through plenty of arts and crafts; restful story times and free play. The children will be grouped by age and ability and activities offered will be suitable for each relevant age group. Each morning and afternoon session will consist of various activities lasting about half an hour, with lively sessions followed by restful times, so that the children can regain their energy. There will also be time for treasure hunts, party games, swimming, parachute fun and free play outside. Movement skills will be taught through music and movement, ball skills, short tennis and uni-hoc. The promotion of gross motor skills will be coupled with the adventurous instincts of the child in den building and nature time. The arts and crafts will be based around creative play with paints and modelling materials as well as the usual cutting, gluing and colouring activities. To compliment all this, there will be the opportunity to try some basic cooking. There will be a supervised quiet period during lunchtime for children who are staying all day. The children will usually be divided into small groups and will be able to move between groups if there is an activity they do not wish to do. We will provide orange squash or water and fruit or biscuits for each break. Please feel free to bring an alternative for your child if you would prefer. Healthy snacks and water will be available all day. Certificates will also be awarded. The children should wear comfortable, loose clothing that are weather appropriate as many of the activities require a short walk to reach them. Please don't forget to let us know any special needs your child may have. Please note that all Junior Troopers should be "potty� trained and out of nappies. Due to the administration problems of supplying lunch for half day pupils, it will only be provided for Junior Troopers attending the full day course. Children's Activities Entertainment will be available late afternoon, Monday to Friday. Junior Troopers are very welcome to watch but must be in the direct care of parent/guardian. Viewing priority will be given to Children's Activities students. Tilly Farr is once again the Team Leader of Junior Troopers. 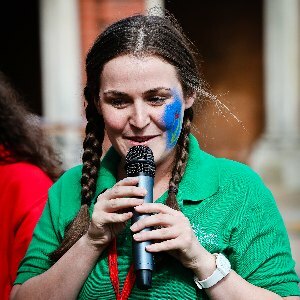 She has been a part of Marlborough College Summer School for the last three years and looks forward to using this experience to plan an exciting time for all. Tilly graduated with a BA Hons Degree Early Childhood Studies in 2012 and currently works within the Early Years Team at Cheltenham College Preparatory School. Tilly believes that during the holidays all children should be able to relax and unwind in a safe environment, allowing them to make the most of all the activities on offer. Her specialism is having fun!